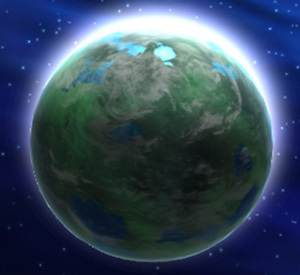 A simple clerical error in the Old Republic planetary registry lost the planet Wayland from all known charts, and doomed the expeditionary vessel seeking to settle a colony there. Once on Wayland, the colonists were on their own, completely forgotten in the unfathomable bureaucracy of the Republic. This was the start of misfortune for the intrepid colonists. Their vessel crashed upon arrival. Though the colonists persevered, and for a time, developed a pleasant life in the Wayland environs, the lack of resupply vessels meant that many of their modern innovations fell into disrepair. The human colonists regressed technologically, discarding their blasters for bows and arrows, their modern fabrics for furs and hides. The colonists clashed with the two native intelligence species on Wayland, the crystal-skinned Myneyrshi and the lumpy armor-plated Psadans. While the humans at first dominated the more primitive species, as the colonists regressed, the struggle became more even-sided. Centuries later, Palpatine discovered Wayland. He took special interest in the isolated world, and visited it himself. For security purposes, he commanded that its absence from official documentation continue. Wayland was to become one of Palpatine's trophy worlds, a secret and safe repository for his rare treasures and prized pieces of technology. After the rise of the Empire, Imperial engineers hollowed out a storeroom within Mount Tantiss, and the Emperor installed a powerful Force-wielding Guardian to protect the trove. Years later, the insane Jedi clone Joruus C'baoth boasted proudly that he killed the Guardian and took his place, however the ravings of a mad clone are not to be taken at face value. It is more than likely that Joruus C'baoth was the original Guardian, though the truth has been lost to time. The Guardian used his power to force the inhabitants of the world to live together peacefully. Humans, Psadans and Myneyrshi built a city to the southwest of Mount Tantiss, though their tensions never truly subsided. Mount Tantiss was located in Wayland's northern hemisphere, near the edge of its main continent. Rediscovered by Grand Admiral Thrawn, the Mount Tantiss storehouse contained the tools he needed to retake the Core Worlds from the New Republic. In addition to a working prototype of a modern cloaking shield, Mount Tantiss hid thousands of Spaarti cloning cylinders. The Spaarti cylinders -- refinements of Kaminoan technology developed on Cartao during the Clone Wars -- became a nearly inexhaustible source of new stormtroopers for Thrawn to use. The Mount Tantiss complex had only one entrance, located on the southwest side. The peak of the complex held an emergency shuttle hangar, the royal chambers, and the Emperor's throne room with a 20-meter wide hologram of the galaxy. The fully functioning Spaarti cloning cylinder chamber sat inside a vast natural cavern many stories high. Thrawn had hundreds of Force-blocking ysalamiri transplanted to the cloning chamber to prevent any negative side effects from the rapid pace of his clone growth. The cloning complex and most of the mountains were destroyed when Lando Calrissian and Chewbacca sabotaged the central equipment column. While investigating the ruins of Mount Tantiss, New Republic researchers found evidence that implicated the Bothans in the tragic destruction of Caamas, decades earlier. This sparked off political tensions that nearly brought the New Republic to civil war. The Noghri, transplanted from their doomed world of Honoghr, built a colony on Wayland called New Nystao. The Yuuzhan Vong would come to attack this new home, causing much damage, though casualties were minimal.